Manchester United forward Marcus Rashford sent an emotional message to former manager Louis van Gaal after it was announced that he would be retiring from management. The Daily Mirror are among the sources to today report on the Dutch tactician calling it a day at the age of 67, following a long and successful career in the game. Van Gaal spent two seasons in charge at Old Trafford, winning the FA Cup at the end of his second campaign before being somewhat harshly replaced by Jose Mourinho shortly afterwards. While LVG will most likely be remembered better for his work with clubs like Ajax, Barcelona and Bayern Munich, he did have one crucial impact in his time at Man Utd – and that was in bringing through exciting youngster Rashford. The England international scored twice on his debut for United after Van Gaal gambled on him in a Europa League game, and he never looked back. 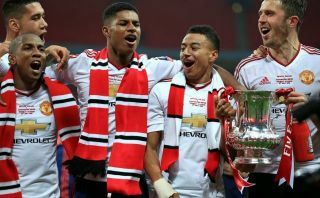 Now a regular for MUFC and England, Rashford is one of the finest players at the club, and it’s clear he still remembers the contribution Van Gaal made to his career.